There are a few things you can do to make your plumber’s life easier while he’s fixing your problem. Here are five plumbing tips you wish your plumber told you. We’re not here to entertain you — or your kids. 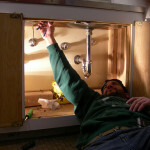 Plumbers like to complete their work without constant interruption from homeowners, or their kids. They’re there not only to repair your pipes, but also to make a living. The faster they complete the task at hand, the sooner they can move on to the next. If a homeowner is breathing down his neck or kids are hovering around with plastic wrenches trying to “help,” the plumber could get distracted, which could lead to shoddy or inferior work. Explain your problem and let the professionals get to work. Kids may not understand that the bowl of sparkling blue water in the bathroom is not a place to play with their toys. Small objects can easily get flushed, causing a blockage in your toilet. Keep the lid down as much as possible, and don’t let your kids use the bathroom as their personal playhouse. If you’re not a plumber, leave the repairs to the professionals rather than trying to do it yourself first. They’re certified and licensed in their field of expertise and know how to remove, replace, repair and put things back together so they work. Years of knowledge and experience allow them to quickly and gracefully repair your plumbing. Don’t risk further complicating your problem by trying to fix it yourself first without proper training and equipment. Last week’s dinner smells good. Drains, whether in the kitchen or the bathroom, are a prime candidate for clogs. Just because something goes down the drain doesn’t mean it will never be seen (or smelled) again. This is especially true in the kitchen, when food particles go down the drain, and over time, become part of the buildup on the pipes. The buildup will cause the water to drain slowly, and eventually it will clog the pipes completely, trapping decaying food and resulting in unpleasant odors. Cleaning your drains regularly with vinegar and soda is a natural way to sanitize the pipes and one of the best plumbing tips for a fresh-smelling drain. Having maintenance done each year can mean extra savings in your pocket by preventing potential problems or detecting existing problems before they get worse. For example, service your water heaters each year to ensure all parts are functioning properly. Generally, septic tanks should be checked every one to three years. The frequency depends on how many people live in the home and how much water is being generated through the system. For all of your plumbing questions and concerns in the Johns Creek area and beyond, contact the experts at Delta The Educated Plumber for fast, efficient, quality customer service.